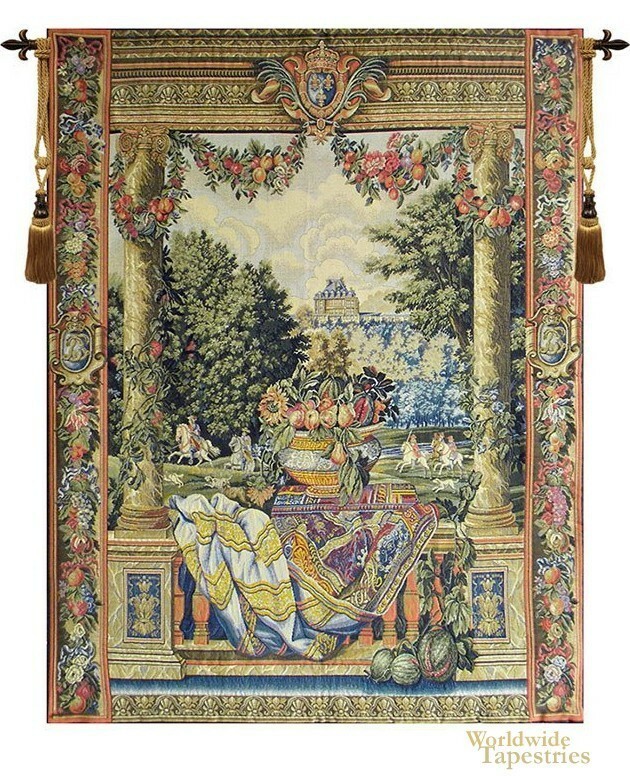 Part of the series known as Tentures de Maisons Royales (Tapestries of the Royal Households), this tapestry shows Versailles, one of the most famed homes of King Louis XIV. Designed by Charles Le Brun (1619-1690), each of the pieces represented one of the months on the calendar. The view from Versailles is from the veranda. It overlooks the gardens and grounds where courtiers ride on horseback. In the foreground, an ornate urn overflows with an arrangement of flowers and fruit. A prolific artist, Le Brun rose to the position of king’s primary painter, or Premier Paintre de Roi. Over a 30 year period, he perhaps did more than anyone else to define the style of the Baroque period. This tapestry is lined and has a tunnel for easy hanging. Note: tapestry rod and tassels, where pictured, are purchased separately. Dimensions: W 52" x H 60"